When these dresses are no longer in good enough shape for another wedding, there are ways the beautiful fabrics can be reused. This guide is about using an old wedding dress. I have my mother's wedding dress (it is about 50yrs old) and want to make something for my children out of it. Does anyone have any ideas? I made the grandkids (7) each a ring bearer pillow. I know it would have made her (my mom) happy to be a part of each of their weddings. Making a First Holy Communion dress might have a lot of meaning. I've seen throw pillows made of wedding dress fabric/lace. Also, you could cut out squares of it to use in a quilt (or several quilts) along with other special fabrics like prom and bridesmaid dresses, baby's blanket, etc. I had handkerchiefs and garters made for all of my children (3 girls and 1 boy- for his wife to use). They made wonderful "something old"'s, and the handkerchieves were carried with the bouquets. I suggest making a doll gown out of it to display. It would be great to make it in the original style. I had a mink coat left to me by my grandmother but it wasn't really wearable. I had it made into teddy bears and gave one to each of my 3 children. Maybe something like this could be done with the gown. I would think that a few shadow boxes made with some of the gowns fabric, maybe a few pics of the woman that wore the gown and the man she married, a few other pieces of personal items. A pic of the one you're giving the item to, would make great keepsakes. My grandmother had a christening gown made for her 4th child, a son, and the remainder was made into rosary holders for her 3 daughters. I re-made my daughter's Victorian dress on her 10th anniversary for a more updated shorter design. They renewed their vows in Disney with all 4 daughters wearing white and black. It would be special to make each child or grandchild a covered photo album for their own wedding photos. You could include a small note and photo of the original wearer and include a family tree inside the front cover of the album for a keepsake. I recently received parts of my mother's wedding dress, namely the underlining. It is in wonderful shape and I would like to make some sort of keepsake out of it. It wouldn't fit me and I am already married, but I don't know what to make. Does anyone have any suggestions? It's made from very heavy satin. I don't have any idea how much yardage you have but why not make a frilly decorative pillow to go on your bed. Something that everytime you look at it, you will think of your Mother. I got my father's bath robe after he died. We were going to share it among siblings a year at a time, but my sister found a lady who took the robe and made 4 teddy bears out of it. That way we all had something of daddy's and it was cute to boot. My teddy bear was present for both my daughter's weddings and was posed in most of their photos. Depending on yardage, you could use it for a small decorative quilt, and embroidery your parents wedding date/name on one square, your name on one (with your spouse and date if married) on another, siblings on others. Or just the children and use beads or embroidered embellishments on the random squares to make a family tree type. Or, put your parents names and anniversary in the middle square, then print photo's of them and their children on the transfers you can buy and use those on other squares. I made a "memory" quilt (made 10" squares with 2" binding) out of my wedding dress lining for my son/daughter in law doing this with their names/date in the center, a couple of random squares had the lace appliques from the outer layer, some had embroidered flowers in their wedding colors, etc. This way I still have the outer layer and some of the lining for a gown for future grandchildren. I have 2 daughters who will someday marry. My mother's wedding dress is still in her attic and is very worn, fragile, and grayish in color. I want to use pieces of her dress to create "something old" for each of them to have on their wedding day. Her veil is also with the dress and I want to incorporate this into my plan. This is what I did with my mother's old gown. I asked the florist to incorporate part of the lace of my mother's dress in to their bridal bouquet. The florist did an amazing job and it looked beautiful. I did this for all 3 of our daughters. My mother was passed away by the time our daughters got married, so this was a very special way to include her in the ceremony. I hope your daughter has a beautiful wedding and a happy marriage. Most wedding dresses are worn only once and then stored. Here are some craft ideas for recycling an old wedding dress. You could try making evening purses, beaded tops, use as appliques on other tops or skirts, window valances, evening skirts, or prom dresses (by combining part of the wedding dress with a satin type skirt/beaded bodice or satin bodice/beaded skirt). 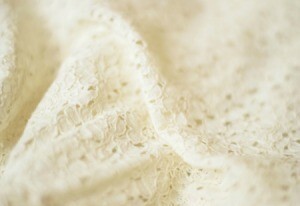 Make a christening dress for your baby. How about attaching some of the lace or beadwork to a scrap of velvet in a darker color and then framing the piece in a nice frame to hang on the wall. I have seen this done with lace doilies, brass buttons, medals, etc. It looks very nice. Dye them and give them to the drama department of the local school. Really bright colors that show up on stage! Red, yellow, orange and purple. Make a new wedding dress or prom dress out of the ones that are outdated. There are yards of satin, lace and the under-skirting that would make some girl, that otherwise couldn't afford a new dress, something spectacular. Ask the school counselor if there is someone that wouldn't be offended by charity and go for it. One idea is to make angel dolls or angel bears. You could make a small dress pattern and attach feathered wings purchased from a craft store. Also, there are charity sites that make over wedding dresses into burial buntings for babies. It is such a tragedy for a family when a baby passes; and, of course, they would like to have them dressed in something beautiful. There aren't too many places out there that grieving parents can go shopping to pick up such an item. I think it is a wonderful use for an item that is enmeshed in the symbolism of two people beginning a life together. That dress can then become an item that becomes important to a family as they grieve the earthly loss of their child and celebrate a heavenly journey at the same time. This is just an idea to think about. My grandma made a communion dress out of an old wedding gown and all her granddaughters wore it for communion! It was very special to all of us (5 sisters) that we got to all wear it. The veil too was handmade. She made the sack that the cards are put in for weddings. She also made a beautiful table cloth with some of the lace (she dyed it with tea) and then overlaid it on a beautiful cream cotton satin fabric. There are so many things. Halloween outfits, head pieces etc. Have fun! 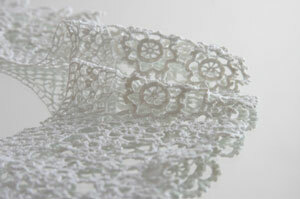 What about fancy hankies for brides as "something old". Why not make an all-white crazy quilt out of them? You could give the finished quilt as a wedding present. Or dye the fabric different colors before you piece the quilt and keep it for yourself! I have a small story. It was getting around the time for my daughter to be baptized. I asked my mother if she could give me the gown my grandmother had bought for my baptism. She told me that I could borrow it but not keep it. Well, I wanted to have it to pass it down so that my daughter's child could use it as well, and continue passing it down. In turn, I decided to have her gown made out of my wedding dress and her First Communion dress as well. I even had enough that a new Cabbage Patch doll has a dress exactly like my wedding dress, but smaller for her doll collection. I used one along with old prom dresses to make 'dress-up' clothes for my niece. All her friends wanted to wear them when they played. A few of the gowns/dresses looked nice enough to actually be worn by a flower girl in a wedding. I also made several ring-bearer pillows from dresses, along with a lacy quilt made for a daughter's christening from her mother's wedding gown. I have one I put on an old dress form. How about using the material for wrapping a wedding gift? The beadwork and lace would make a perfect package. Also, here's another idea. I just finished making a "My Secret Stuff" box for my granddaughter. It was just a paper mache box covered with material in her favorite colors, lined inside with a contrasting color. I folded the material for the sides and top so as to have a "pleated" look. I attached artificial flowers on the top. I wrote her name in puffy pen on a round circle of contrasting color and glued it to the bottom to cover all the pleats. She just turned 8 years old and she absolutely loved the gift. Inside I place dozens of pieces of candy. Each one was wrapped with paper I printed on my computer with her photo on it and a birthday wish for her. She had lots of sweets to give out to all the little girls who came to her party. Now after reading the other posts, I would have liked to cover it with material from her mother's wedding dress or my old one. What a treasure to pass down to the next generation. If you made this as a wedding present, you could put family photos of the couple when they were small inside the box. What a fun, memorable gift, made with your own hands! The American Sewing Guild of America collects wedding gowns from thrift stores & garage sales to make burial gowns & envelopes to store the information about the baby that died. They also have women who knit or crochet baby blankets for the mother to keep after she's held her dead baby. All supplies are donated by quilters. You could turn your dress into a fancy pillow or a table runner.